Hepatocellular carcinoma (HCC)4 is the most pernicious cancer, with a high mortality rate. While the incidence of HCC is increasing worldwide with relevance to chronic hepatitis C virus (HCV) infection, there is strong etiological evidence linking chronic hepatitis B virus (HBV) infection to the incidence of HCC in China (1, 2). Despite the improvement of surgical techniques and other conditions, the prognosis of HCC remains poor because of late diagnosis. The lack of sensitive and specific methods for early diagnosis makes effective treatment virtually impossible. The main reason for this limitation is the inability of physics-based imaging to detect the cancer at a very early stage. However, alterations in the cancer cells can still be recognized by immune cells and rejected in an immune response. Detection of these altered genes and their proteins by molecular and immunological approaches may provide a means for sensitive and specific diagnosis and potential targets for immunotherapy. The immune response against tumor Ags in cancer patients has been convincingly documented over the last decade by the detection of tumor Ag-specific CTLs (3) and Abs (4). The integration of molecular and immunological techniques has led to the identification of a large number of tumor Ags and their genes. As a result of this research, cancer-testis (CT) Ags and melanocyte-specific differentiation Ags have become useful in the clinic (5). Two major approaches have been developed for the identification of tumor Ags and the cloning of their genes. One is to define CTL-recognized T cell epitopes in proteins expressed on cells transfected with a tumor cDNA library (6). The second is to define B cell epitopes in Ags that are specifically recognized by Abs in cancer sera. This technique is known as serological analysis of recombinant cDNA expression libraries (SEREX) (7). The application of these methods to identify tumor Ags in various histological types of cancers has produced valuable information that may help define factors involved in the multiple stages of tumorigenesis and further identify immune targets for diagnosis and vaccine-based immunotherapy. Nevertheless, the complete repertoire of tumor Ags (tumor immunome) and their encoding genes is far from being fully defined. This prediction is based on the following observations. The gene profiles revealed by immunological methods from different histological types of cancers or even from the same histological type of cancer in different individuals are significantly diversified. Also, only a small fraction of genes have been repeatedly cloned from different cDNA libraries prepared from distinct histological types or from the same histological type of cancer in different individuals. In HCC the expression of altered and/or mutated genes has been demonstrated using molecular techniques. Mutations of genes such as p53, RB, and ras (8, 9, 10) and overexpression of genes such as glutamine synthetase (11), α-fetoprotein (12), diazepam binding inhibitor (DBI) (13), aldose reductase (14), CD24 (15), and others observed in cDNA microarray (16, 17) have been reported. Recently, the CT Ags MAGE-A1 and -A3 have been found highly expressed in HCC, while the other MAGE-A family members are less frequently expressed in HCC (18, 19, 20, 21). However, the immunological identification of tumor Ags in human HCC is rare (22). A methodology similar to SEREX was also applied to clone a gene, whose encoding protein p62 had already been identified by immunoprecipitation using autoantibody present in the sera of HCC patients (23). To define HCC-expressed tumor Ags, we constructed four cDNA expression libraries using resected human HCC tissue samples and screened them by SEREX, using the Abs present in autologous or allogeneic sera. A total of 55 different HCC genes encoding immunogenic proteins have been identified. Of these, 40 are known, and 15 are novel molecules. Our study has defined two CT Ags predominantly expressed in HCC and other histological types of cancer cells. Two other Ags were overexpressed in HCC. Another four Ags, each of which was expressed in the particular cancer cell line(s), but not in normal counterpart tissue(s), may help identify metastatic cancer cells. These results also revealed that an immune response against autoantigens is activated in HCC cancer patients. All samples of HCC tissues with paired adjacent liver tissues (5 cm distant from HCC) and gastric cancer tissues were obtained during surgical resection from our Teaching Hospitals, Peking University Health Science Center. The melanoma, squamous cell carcinoma of the head and neck (HNSCC), and urological cancer samples were collected by Ludwig Oncology Unit, Austin Repatriation Medical Center (Melbourne, Australia). Collection of tissue samples and sera was agreed upon by patients after they gave written consent and was approved by the hospital ethic review committee. The resected tissue samples were immediately cut into small pieces and then snap-frozen in liquid nitrogen until use. All HCC and adjacent noncancerous liver tissue samples were confirmed by pathology. The patients from whom the resected HCC samples were obtained are HBV surface Ag positive, but HCV negative. RNA was extracted from HCC samples with TRIzol reagent (Life Technologies, Gaithersburg, MD), and mRNA was purified by the Poly(A) Track kit (Promega, Madison, WI). Oligo(dT)-primed double-stranded cDNA was synthesized from 5 μg mRNA and ligated into the λZAP phage expression vector according to the user’s manual (Stratagene, La Jolla, CA). A total of four HCC cDNA libraries were constructed, two in Uni-ZAP II vector and two in ZAP expression vector. The primary libraries were in the range of 1.2–5.0 × 106 colonies, and the average length of the inserts was 1.0–1.2 kb (Table I⇓). The HCC cDNA expression libraries were screened with either autologous or allogeneic sera obtained from HCC patients. Autologous serum was used to screen HCC cDNA libraries 1 and 3, and the screening procedure was performed as previously described (24) with slight modifications. With low nonspecific Ab binding, serum 1 was directly used to screen the HCC cDNA libraries without Escherichia coli- and phage-infected E. coli lysate absorption. In contrast, serum 3 produced high reactivity to E. coli and required initial absorption to E. coli- and phage-infected E. coli lysates to remove those Abs reactive to vector system Ags. Library 1- and 3-transfected E. coli produced many false positives, as the libraries expressed high levels of IgG molecules reacting to goat anti-human IgG Ab. To remove these clones expressing IgG molecules, the screening method applied by Tureci et al. (25) was used with some modifications. Briefly, in the screening of libraries 1 and 3, plaques were transferred onto nitrocellulose filters (Amersham, Arlington Heights, IL) prerinsed in 0.5 mM isopropylthio-β-d-galactoside for 6–8 h at 37°C. After blocking with 1% BSA/TBS overnight at 4°C with shaking, the filters were washed with TBS and preincubated with a 1/15,000 dilution of alkaline phosphatase-conjugated goat anti-human IgG (H+L) (secondary Ab; Promega) for 1–2 h at room temperature. Reactive clones were visualized with 4-nitroblue tetrazolium chloride/5-bromo-4-chloro-3-indolyl-phosphate. The resulting blue dots were marked on the filter with a needle. These premarked membranes were extensively washed with TBS, and then incubated with diluted autologous patient serum (1/500). The filters were stained and processed for visualization in a manner identical with that described above. Only clones that appeared blue and unmarked from the needle in the prescreening were considered serum positive. These clones were subcloned three times to obtain monoclonality. When libraries 2 and 4 were screened with autologous serum, there were very few clones reactive with their respective sera. With the idea that tumor Ags may be commonly expressed on tumors originating in different patients, we screened libraries 2 and 4 with serum 1 as described above. Because there was no detection of IgG false positive clones in libraries 2 and 4, preincubation with the secondary Ab was omitted. Numerous positive clones from libraries 2 and 4 were obtained with allogeneic serum screening. Monoclonalized phage cDNA clones were converted to pBluescript (libraries 1, 2, and 4) or pBKCMV (library 3) phagemid forms by in vivo excision. The plasmids were purified by Qiaprep spin columns (Qiagen, Valencia, CA), and the sizes of the inserts were determined by restriction enzyme digestion with EcoRI and XhoI. The cDNA inserts were sequenced with T3 and T7 primers by the dideoxy chain termination method using the BigDye Terminator Cycle Sequencing kit (PE Applied Biosystems, Foster City, CA) and an ABI PRISM automated DNA sequencer (Perkin-Elmer, Norwalk, CT). The mRNA expression pattern of the 15 novel cDNAs was assayed by RT-PCR using panels of commercially available cDNA paired with RNA extracted from normal tissues and tumor cell lines (Clontech Laboratories, Palo Alto, CA). One panel was comprised of 16 normal tissues: brain, heart, kidney, liver, lung, pancreas, placenta, skeletal muscle, colon, ovary, peripheral blood leukocyte, prostate, small intestine, spleen, testis, and thymus. The panel of tumor cell lines included one cell line each of breast, prostate, ovarian, and pancreatic cancers and two cell lines each of lung and colon cancers. RNA from HCC, paired adjacent noncancerous liver tissues, and gastric cancer tissues was extracted and primed with a dT(18) oligonucleotide. The RNA was treated with DNase I, then reverse transcribed with Advantage reverse transcriptase (Clontech Laboratories). Gene-specific PCR primers were designed and synthesized to amplify cDNA fragments 600-1200 bp in length with an estimated primer melting temperature between 65 and 70°C. All cDNA synthesis reactions were set up in duplicate with or without reverse transcriptase, the latter was used to check genomic DNA contamination. The integrity and quantity of the cDNA were determined by the amplification of G3PDH. RT-PCR was performed with 30–35 cycles of 30 s at 94°C, 30 s at 65°C, and 1 min at 72°C, followed by 7 min at 72°C. Qualitative PCR and visualization of target bands with ethidium bromide staining were performed to determine the expression of the novel genes in normal tissues and cancer cell lines. Semiquantitative PCR was applied to evaluate the relative densities of the five novel HCC gene cDNAs expressed in HCC tissues and non-HCC tissue samples. The OD of the target bands was analyzed by Quantity One software (Bio-Rad, Hercules, CA) after scanning with Gel Doc 2000 (Bio-Rad). The total intensity of the target band was calculated as the sum of all the intensities of the pixels that make up the band. The sequences of paired primers for the amplification of five valuable HCA gene cDNAs were as follows: HCA90: forward, cct ggg ctc aag caa tcc tcc tgc ctt agc; reverse, ggg ctc ctg aga gat gac ggt gtt tgg acg; HCA519: forward, gca agc tat tgt cac acc ttt c; reverse, atg att aca gga gtg gca cat c; HCA520: forward, cag gca tga gat gct gca ggt tct ccg tc; reverse, tgt ggt ctg tta gga acc ggg ctg cac ag; HCA587: forward, cgg gat cca tgc ctc ccg ttc c; reverse, cgc tcg agt cac tca gaa aag gag acg tt; and HCA661: forward, tac act cgg cct gga aga att g; reverse, tct tcc tcc tcg aac tgc tg. NBs were performed with total RNA extracted from HCC and paired adjacent non-HCC liver tissues. RNA integrity was examined by electrophoresis in formalin/4-morpholinepropanesulfonic acid gels. Thirty micrograms of RNA per lane was first separated by electrophoresis in 1.2% agarose containing 3% formaldehyde and then blotted onto nitrocellulose membranes (Amersham Hybond-C). The nick-translated 32P-labeled probes were serum-positive partial cDNA sequences of HCA519 (clone HCA503 contained 747 bp of HCA519 cDNA) and HCA587 (531 bp) and the full-length cDNA sequence of HCA661 (1.7 kb). After prehybridization, the membranes hybridized with the specific 32P-labeled cDNA probe overnight at 65°C in hybridization solution (6× SSC, 5× Denhardt’s solution, and 0.1% SDS). The membranes were then washed three times for 30 min each time at 65°C in 0.1× SSC/0.1% SDS solution and exposed to Kodak X-OMAT-AR film with intensifying screens for up to 7 days at −70°C. The size of full-length mRNA was estimated in comparison with the mobilities of 28S and 18S ribosomal RNA. Of the 15 novel genes identified from SEREX screening, 12 cDNAs spanned an open reading frame (ORF) and complied with the Kozak rule (26). The full-length gene of the other three cDNAs was either extended by RACE or by searching expressed sequence tag databases. The full-length cDNA of these three genes were confirmed by RT-PCR. The sizes of full-length HCA519, -587, and -661 were also confirmed by NB. Sera from allogeneic HCC patients, HBV- and HCV-infected patients, head and neck cancer patients, and healthy donors were screened by positive phage clone analysis for their reactivities with Ags encoded by the 15 novel full-length cDNAs. In this assay an equal number of serum-positive clones and negative control phage clones were mixed, cultured, and transferred to nitrocellulose filters, then processed for reactivity to serum with or without E. coli lysate absorption. The serum dilution was 1/500 for unabsorbed and 1/200 for absorbed samples. Data from integrate OD scan were presented as the mean ± SE. Statistical analysis was performed using Student’s t test to assess the significance of integrate OD data. A value of p < 0.05 was used as the fiducial limit of significance. Immunoscreening of the four HCC cDNA libraries with autologous or allogeneic serum produced a total of 116 serum-reactive clones. These clones represented 55 different Ags. Of these, 40 encoded known Ags, and 15 encoded novel Ags (Table II⇓). Of the 15 novel genes, three were created by oligonucleotide insertion, one by DNA deletion, and the remaining 11 were unique. Four of the 11 unique genes were confirmed in DNA sequence by their corresponding clones in the published human genomic sequence. The HCA64 cDNA sequence was identical with the Homo sapiens DBI-related protein-encoding gene, with the exception of a 664-bp insertion (665–1428 bp) at nucleotide position of 662. This insertion introduced a translational stop at nucleotide position 676. The HCA64 cDNA encoded a 225-aa protein, 139 aa shorter than the DBI-related protein (364 aa). HCA90 cDNA was generated by an insertion of 108 bp (from nt 1520–1627) between exon 10 and exon 11 of HCA519, adding 36 aa to the protein. This 108-bp insert was a new member of the human Alu-J subfamily (GenBank data). The HCA137 cDNA sequence mapped to that in human chromosome 8, but contained two additional inserts (detailed information in GenBank, accession no. AF287265). These two inserts have not been found in the human genome to date. A deletion of 372 bp (encoding 124 aa) at nt 648-1019 in HCA56 cDNA created a novel gene that we named HCA56A. HCA56 and HCA56A may be attributed to differential splicing. HCA56 cDNA has a 95% homology with a gene fragment isolated by anti-ligatin Ab (27); it is now defined by NCBI as ligatin-encoding gene. HCA661 is a new member of the H. sapiens transcription factor DP-1 (TFDP1) family, sharing a homology of 88% in nucleotides and 73% in amino acids with TFDP1 (28). The cDNA sequence of HCA661 has a 100% homology to the genomic sequence clone of PAC 358H7. The sequence of HCA58 cDNA was recently confirmed by the human genomic clone PR5-90108, of which two isoforms exist as the HCA58 and the cytochrome c oxidase VIIB subunit. Thus, HCA58 appears to be involved in oxidization activity. The HCA519 cDNA was found to be identical with the H. sapiens-restricted proliferation-associated nuclear protein 100 cDNA (29, 30). Its DNA sequence information was released after the cloning of HCA519. HCA520 has 61% nucleotide level homology with the calcineurin homologous protein, an essential cofactor for Na+/H+ exchangers (31). The HCA587 cDNA was identical with MAGE-C2 (32) and has a 3-bp difference compared with CT10 (33) at nt 19(G→A), 895(T→C), and 1329(A→G). The latter 2-bp changes were in the ORF region, producing two amino acid substitutions (M189T and K334E). According to the recently released human genome, the corresponding sequences of our four novel HCA cDNAs have been mapped to different locations. The clone RP11-212N14 mapping to chromosome 8 contained HCA59; the BAC clone CIT987-SKA-345G4 contained the HCA520 sequence. An identical sequence of HCA66 was found in the human genomic clone HCIT307A16, and HCA67 was found in clone RP11-108A14. The corresponding sequences of HCA112 cDNA and HCA127 cDNA have not yet been found within the human genome. Apparently, these novel genes cloned from HCC are not altered genes; instead, they may represent genes predominantly expressed in HCC cells. Based upon the function of the 40 known Ags associated with HCC as defined by SEREX, they have been classified into 10 functional categories as shown in Table III⇓. Many of these molecules are regulatory proteins functioning in glycolysis, energy consumption, protein synthesis, and DNA synthesis. Overexpression of these molecules may reflect the accelerated events of cell metabolism and cell proliferation. Additionally, HCA119 is the mitochondrial mRNA for NADP+-dependent malic enzyme, normally not produced in the liver, but required for pyruvate generation in HCC cells (34, 35). RT-PCR was used to determine mRNA expression patterns of the 15 novel genes identified from the HCC cDNA libraries. A series of tissues and cell lines was examined, including normal tissues, tumor cell lines, HCC tissues and paired noncancerous adjacent tissues, liver tissues other than HCC, gastric cancer, and melanoma tissues. The mRNA expression of the 15 novel genes in normal tissues was determined by RT-PCR and is presented in Table IV⇓. Expression patterns can be divided into three categories. 1) Expression in two types of normal tissues including testis: HCA587 mRNA and HCA661 mRNA (Fig. 1⇓) were substantially expressed in testis and weakly expressed in normal pancreas (data not shown). 2) Limited expression: ten of the HCA mRNA transcripts were found distributed in three (HCA112) to nine types (HCA67) of normal tissue. 3) Ubiquitous expression: mRNA transcripts of HCA56, -56A, and -66 were expressed in all 16 normal tissues tested. HCA127 mRNA was detected in 14 normal tissues. 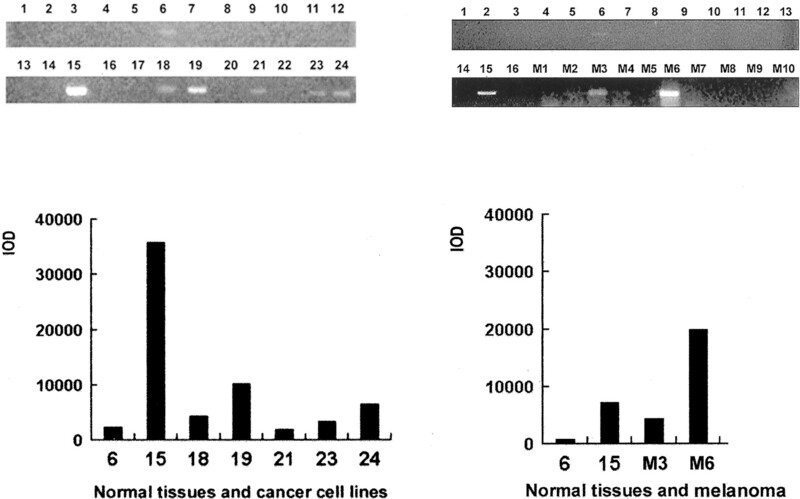 Expression of HCA587 mRNA in 16 normal tissues and eight cancer cell lines. Gel electrophoresis of RT-PCR products shows HCA587 transcripts in testis, normal pancreas, and some cancer cell lines. 1–16, normal tissues: 1, brain; 2, heart; 3, kidney; 4, liver; 5, lung; 6, pancreas; 7, placenta; 8, skeletal muscle; 9, colon; 10, ovary; 11, leukocyte; 12, prostate; 13, small intestine; 14, spleen; 15, testis; 16, thymus. 17–24, cancer cell lines: 17, breast carcinoma (GI-101); 18, lung carcinoma (LX-1); 19, colon adenocarcinoma (CX-1); 20, lung carcinoma (GI-117); 21, prostatic adenocarcinoma (PC3); 22, colon adenocarcinoma (GI-112); 23, ovarian carcinoma (GI-102); 24, pancreatic adenocarcinoma (GI-103). M1-M10, cDNA samples prepared from fresh melanoma tissues. To check the weak expression of HCA587 mRNA in pancreatic tissue, three cDNA samples (two purchased from Clontech and one prepared from fresh normal pancreas) were tested by RT-PCR. All three samples showed weak expression of HCA587 mRNA. To exclude genomic contamination, primers (primer 5, 5′-AATCTGACGGATCGGAGGCATTTG-3′; primer 6, 5′-TGCTACTTTCTTCAACAAGCTAAGCAAAGC-3′) were applied. The size of the amplified cDNA should be 2.0 kb, while the genomic DNA fragment should be 3.0 kb. The PCR products obtained were 2.0 kb, confirming no genomic contamination. Thus, HCA587 mRNA was truly expressed at low levels in the pancreas. Expression in cancer cell lines. A panel of eight cancer cell lines (breast, G1-101; lung, LX-1 and G1-117; colon, CX-1 and G1-112; prostate, PC3; ovary, G1-102; and pancreas, G1-103) was tested. HCA519 and HCA587 were expressed in lung, colon, prostate, ovarian, and pancreatic cancer cell lines, whereas HCA90 and HCA59 were expressed in breast, lung, colon, ovarian, and pancreatic cancer cell lines. HCA520 was only expressed in the ovarian cancer cell line. HCA661 was not expressed in any of the eight cancer cell lines tested. Expression in HCC, paired adjacent noncancerous tissues, and other cancer tissues. The five novel genes, expressed in various cancer cell lines and in a few types of normal tissue, were analyzed for their distribution in the samples of HCC, paired adjacent tissues, cirrhosis, and normal liver tissues. As shown in Fig. 2⇓, the expression pattern and frequency were classified into four groups. 1) Specific expression in HCC: HCA520 mRNA transcript was specifically expressed in five of 10 HCC samples, with no detection in paired adjacent tissues or in cirrhotic or normal liver tissues. 2) Highly expressed in HCC, weakly expressed in adjacent tissue: The HCA587 mRNA transcript was highly expressed in 14 of 20 HCC samples and weakly expressed in one of 20 paired adjacent tissues. There was no expression in cirrhotic or normal liver tissues. The average intensity of HCA587 mRNA transcript was 16-fold higher in HCC tissues than in adjacent tissues (p < 0.01). The HCA661 mRNA transcript was substantially expressed in five of 17 HCC samples, weakly expressed in two of 17 paired adjacent tissues, and null in nine normal liver samples. The average intensity of the HCA661 mRNA transcript was 10-fold higher in HCC tissues than in the adjacent tissues (p < 0.01). The HCA90 mRNA transcript was strongly expressed in all 10 HCC samples and weakly expressed in all paired adjacent tissues, with no detectable expression in cirrhotic or normal liver samples. The average intensity of the HCA90 mRNA transcript was 21-fold higher in HCC tissues than in the adjacent tissues (p < 0.01). 3) Strongly expressed in HCC and weakly expressed in cirrhotic or normal liver samples: HCA519 was strongly expressed in all 10 HCC samples and weakly expressed in all paired adjacent tissues and in approximately half of the cirrhotic and normal liver samples. The average intensity of the HCA519 mRNA transcript was 30-fold higher in HCC tissues than in the adjacent tissues and cirrhotic or normal liver samples (p < 0.01). Because of the undetectable level of HCA661 mRNA in the eight cancer cell lines tested, its mRNA expression in cDNA samples derived from resected gastric cancer and melanoma tissues was assessed. The HCA661 mRNA transcript was clearly expressed in two of 10 melanoma samples, but was not detectable in 10 gastric cancer samples, 13 urological cancers, or 11 HNSCC tissues. Expression of SEREX-cloned novel genes in the samples of HCC and paired adjacent noncancer tissues. 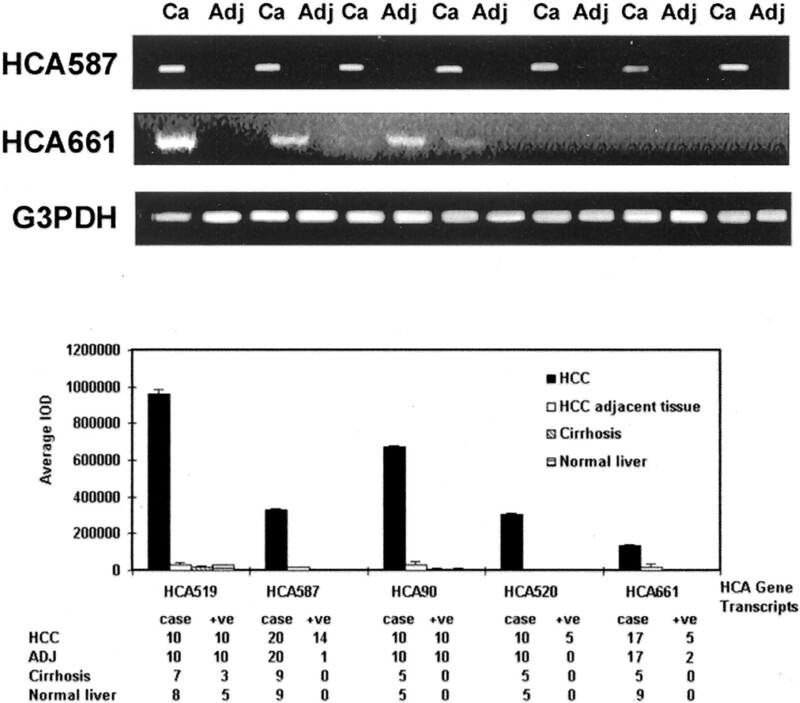 A, Gel electrophoresis of RT-PCR products shows HCA587 and HCC 661 transcripts in the paired HCC and adjacent noncancerous liver tissue samples. RT-PCR for G3PDH was used to monitor the quality of the mRNA samples. B, The relative densities of the five HCC transcripts expressed in HCC tissues and non-HCC tissue samples was evaluated by semiquantitative PCR. The OD of target band in the different tissues was presented. The positive rate of the target gene transcripts in different samples is listed underneath the figure. When the abundance of mRNA expressed in HCC tissues was compared with that in adjacent noncancerous tissues, the levels of HCA519, HCA587, HCA90, and HCA661 mRNA transcripts were 30-, 16-, 21-, and 10-fold higher, respectively. To further examine the RT-PCR results for HCA519, -587, and -661, total RNA was extracted from HCC and paired adjacent noncancerous tissues to be analyzed by NB hybridization (Fig. 3⇓). The hybridization signals of HCA519 and -587 were 3.2 and 2.0 kb, respectively, corresponding to the expected full-length cDNA. In the NB of HCA661, two strong bands of ∼1.7 and 2.1 kb were detected in testis RNA. However, the 1.7-kb band was detected only in HCC RNA, and the band at ∼2.1 kb was detected only in RNA isolated from adjacent non-HCC tissue and normal liver tissue. The DNA sequence revealed that the gene of 2.1 kb was DP-1, and the gene of 1.7 kb was HCA661. NB hybridization of three novel genes in HCC. In the NB analysis, HCA519 and 587 RNA was only expressed in HCC samples, while HCA661 RNA appeared as two bands. The 2.1-kb fragment was present in testis, adjacent non-HCC tissue, and normal liver tissue, but the 1.7-kb fragment was expressed in testis and HCC tissue. Ca, cancer; Adj, adjacent; Nor, normal liver. The DNA sequence revealed that the gene of 2.1 kb was DP-1, and the gene of 1.7 kb was HCA661. To solve the apparent discordance arising from the fact that in normal liver the HCA661 was not detectable by RT-PCR but was detected by NB with a band at ∼2.1 kb, we searched GenBank database and found that HCA661 is a new member of the DP-1 family. HCA661 is highly homologous to TFDP1 (88% in nucleotides), a gene of 2394 bp localized on chromosome 13 (28, 36, 37). It is possible that HCA661cDNA may also hybridize with TFDP1 in NB. In this regard, a pair of primers matched with the conservative region of the cDNA of HCA661 and TFDP1 was applied (primer 1, 5′-GAA CCC GCT CGG GAA GCA GCT CTT GC-3′; primer 2, 5′-CCT GGA ACC TGC CGT CGT GAA CAC-3′). The RT-PCR was performed using the cDNA samples of normal liver, HCC, and testis tissues as templates. According to the DNA sequence of PCR products, the cDNA in normal liver tissue was confirmed to be DP-1, whereas the DP-1 cDNA and HCA661 cDNA were both confirmed to be expressed in testis and HCC. In contrast, The DNA sequence in RT-PCR products amplified from HCC and testis tissues using HCA661-specific primers (primer 3, 5′-TACACTCGGCCTGGAAGAATTG-3′; primer 4, 5′-TCTTCCTCCTCGAATGCTG-3′) was solely HCA661. HCA661 mRNA transcript was not detectable in normal liver samples. Thus, the cDNA of ∼2.1 kb in normal liver tissue shown in NB was DP-1, and the cDNA of 1.7 kb in HCC was HCA661. In testis, both DP-1 and HCA661 mRNA transcripts were expressed. To determine the Ab produced in patients specific against the 15 novel SEREX gene products, positive phage clones expressing the novel Ags were tested for seroreactivity against allogeneic sera collected from 55 HCC patients, 10 head and neck cancer patients, 25 patients with chronic HBV infection, and 20 normal donors. The frequency of an Ab response to these 15 Ags in HCC patients was very low, the highest being three of 55 (HCA137). In one test using allogeneic HCC serum, 10 Ags were reactive. To exclude the possibility that the low frequency of seroreactivity was caused by a high dilution (1/500) of unabsorbed sera, 13 allogeneic sera were absorbed with E. coli/phage-infected E. coli lysates and tested at a dilution of 1/200 in a phage clone assay. Of the 15 Ags tested against absorbed sera, only one serum sample (1/200) became reactive to HCA112, whereas its unabsorbed serum (1/500) did not react (Table V⇓). There were three Ags only reactive with the serum from which the Ag-encoding genes were cloned. In contrast, none of the allogeneic sera collected from chronic HBV-infected patients, head and neck cancer patients, and healthy donors was seroreactive with these 15 novel Ags. While it has been observed that HCC cells express tumor Ags at the mRNA level, including members of the MAGE family and NY-ESO-1 (18, 19, 20, 21, 38), the immunogenicity of these CT Ags in HCC patients is unclear. By screening HCC cDNA expression libraries with the Ab-based SEREX, we identified 55 different Ags. Of these, 40 are known, and 15 are novel, representing a diverse array of molecules with immunogenicity in HCC patients. To determine whether these 15 novel molecules were tumor Ags or autoantigens, their reactivity to allogeneic sera and mRNA expression pattern in normal tissues, tumor cell lines, HCC tissues, non-HCC liver samples, gastric cancer, and melanoma tissues were analyzed. Most of these identified molecules were found as autoantigens in the majority of tissues tested. HCA587 and HCA661 were the exceptions, with restricted expression in cancer cells and normal testis. HCA587 and HCA661 were also weakly expressed in normal pancreatic tissue. The proteins of HCA587 and HCA661 are immunogenic and capable of inducing an Ab response, as they were cloned by Abs in the sera of HCC patients. These two Ags can be defined as CT Ags. The common features of human CT Ags include 1) predominant mRNA expression in testis, but not in other normal tissues; 2) mRNA expression in certain types of cancers; and 3) genes encoding CT Ags mapped to the X chromosome (38). The cDNA sequence of HCA587 is identical with that of MAGE-C2 (32) and has a 2-bp difference from CT-10 (33) in its ORF. This difference resulted in a 2-aa substitution (M189T and K334E). HCA587 cDNA was cloned in 1999 (GenBank deposit date, May 13, 1999, accession no. AF151378) before the DNA sequences of MAGE-C2 and CT-10 were released. MAGE-C2 and CT-10 cDNA were cloned from melanoma cell lines (32, 33) by representational difference analysis. Both were defined as CT Ags based on mRNA expression in a broad panel of cancer cells and absence in normal tissues, with the exception of testis. We have cloned HCA587 cDNA by SEREX and hence demonstrated that the HCA587 protein is immunogenic in vivo. While it was previously reported that CT-10 mRNA was not expressed in normal pancreas (33), we detected its weak expression. As CT Ag SSX-2 is expressed in thyroid (39) and NY-ESO-1 in ovary (38) at low levels, HCA587 can still be generally defined as a CT Ag despite its weak expression in pancreas. Likewise, HCA661 is a CT Ag, as it meets all three criteria: no expression in normal tissues except testis and weak expression in pancreas, high rate of expression in HCC (Fig. 2⇑) and low rate of expression in melanoma (Fig. 1⇑), and localization on chromosome X. HCA661 mRNA was not detected in 10 samples of gastric cancer, five samples of colon cancer, 11 samples of HNSCC, or 13 samples of urologic cancer. The number of allogeneic sera reactive against HCA587 and HCA661 was very low; there was only one positive serum in 55 HCC sera tested. However, all serum samples collected from 25 HBV-infected patients, 20 healthy donors, and 10 HNSCC patients were serologically negative for these two Ags. It appeared that the immunogenicity of these Ags was tumor oriented. The low rate of their seroreactivity to allogeneic sera is similar to that of the MAGE family members. In fact, most CT Ags, either defined by a CD8+ CTL response (MAGEA-1, MAGEA-3) or by SEREX (SSX-2), with the exception of NY-ESO-1 (40), induced a very low frequency of Ab responses in melanoma. The potential of SEREX-defined CT Ags to induce cellular immunity despite a low frequency of Abs in allogeneic sera has been confirmed. In view that the SEREX-defined NY-ESO-1 can induce a CTL response and the CTL-defined MAGEA-1 has also been identified by SEREX (41, 42), this suggests that SEREX-cloned Ags may contain T and B cell epitopes. These epitopes are then capable of inducing both Ab and CTL responses. In this respect the capacity of HCA587 and HCA661 to elicit a CTL response should be further examined; this is a critical criterion to determine whether HCA587 and HCA661 are potential candidates for tumor vaccine. Even if a CTL response can be induced, the capacity of HCA587- and HCA661-specific CTL to kill normal pancreatic cells, which express low levels of HCA587 and HCA661 mRNA, should be tested before its consideration as a vaccine candidate. Although HCA519 mRNA was intensely expressed in HCC samples and many other cancer cell lines, its low expression in normal tissues negates its vaccine candidacy. However, it may serve as a special cell division marker for cancer diagnosis. HCA519 cDNA is identical in sequence to the gene encoding a protein called p100. It is a new nuclear proliferation-associated protein with restricted expression in cycling cells (29). The rate of p100-positive cells in breast cancer is directly relevant to the risk of mortality (43). Likewise, estimating the proportion of HCA519-positive cells in cancer tissue sections may help assess the prognosis of HCC patients. HCA520 mRNA was positive only in an ovarian cancer cell line and was negative in the normal tissue counterpart. HCA58 was expressed in colon and ovary cancer cell lines, but not in the respective normal tissues. HCA59 and HCA67 mRNA were expressed in colon cancer, but were undetectable in normal colon tissue. With their HCA mRNA transcripts expressed in only certain types of cancer cell lines and absent in the normal tissue counterparts, these four Ags may be valuable for the detection of metastatic cancer cells. This immunological diagnosis would be complementary to a pathological diagnosis. The majority of our SEREX-defined molecules from HCC cDNA expression libraries are apparently autoantigens, although we cannot exclude the possibility that some of the Ag-encoding genes may have point mutations. The capacity of these autoantigens to elicit an Ab response in HCC patients is similar to that seen in autoimmune patients. The variety of autoantibodies found in the sera of cancer patients is evidence for an autoimmune response. In view of the fact that in both autoimmune diseases and cancers autoantibodies can be detected against Ags such as small nuclear RNA associated sm-like protein, actin, and even MAGE (44, 45), it is important to distinguish tumor Ags from autoantigens before any immunological manipulations. The molecules defined by SEREX from cancer cells are rapidly accumulating. Among the 55 Ags we have identified in HCC, nine molecules have also been identified by others using SEREX or other immunological methods from different cancers. They are: DBI-related protein in renal cancer and HCC (13, 46), small nuclear RNA-associated sm-like protein and Dna J protein in renal cancer (46), CENP-F kinetochore protein in breast cancer (47), translationally controlled tumor protein in colon cancer (48), p100 (HCA519) in breast cancer (29, 43), and ATPase in HCC (22). From our results we roughly calculate that ∼16% (nine of 55) of HCC-expressed Ags are shared by cancers of other histological types. In addition, numerous complement inactivation molecules have been frequently identified in HCC cDNA expression libraries by SEREX. They include complement H factor, factor H homologue, and factor H-related molecule. Inhibiting complement activation may be one of the means by which HCC cells escape immune attack. Despite the numerous HCC Ags identified by SEREX, none of the Ags identified in other labortories (22) or in our laboratory is exactly identical. Even from the four HCC cDNA expression libraries we screened, only four of 55 Ags are repeatedly identified from different individual libraries. Coupled with diverse Ag profiles from different cancers, it is clear that the tumor immunome is far from being complete. Further identification of tumor-associated Ags from HCC is needed to find more immunogens with potency for effective immunotherapy. In conclusion, our experimental results of tumor Ags in HCC have provided candidates for immunological applications and the molecular features for understanding tumorigenicity. ↵1 This work was supported by grants from Australia-China Institutional Links Program, 1997, National 973 Program in China (G1999053904), Beijing Municipal Government Foundation for Natural Sciences (7001002), and Ludwig Institute for Cancer Research (KSP 003). ↵2 Y.W., K.-J.H., and X.-W.P. contributed equally to this study. ↵4 Abbreviations used in this paper: HCC, hepatocellular carcinoma; CT, cancer-testis; HBV, hepatitis B virus; HCA, hepatocellular carcinoma Ag; HCV, hepatitis C virus; HNSCC, squamous cell carcinoma of the head and neck; NB, Northern blot; ORF, open reading frame; SEREX, serological analysis of recombinant cDNA expression libraries; TFDP1, transcription factor DP-1; DBI, diazepam binding inhibitor. Cohen, P. L.. 1999. Systemic autoimmunity. W. E. Paul, ed. Fundamental Immunology 4th Ed.1067 Lippincott-Raven, Philadelphia.